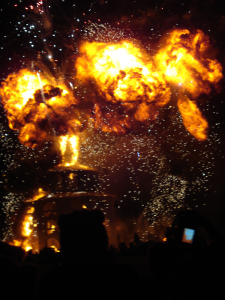 Burning Man 2012 – Whoa, what was THAT all about? We left the playa 8 days ago. We’re still trying to figure out this exhilarating, what is ed exhausting, just-got-mugged-in-a-brothel feeling. Our 9th burn – the 6th for our two kids – started out wild. Then it grew wacky, turned mostly wonderful – and then veered toward the horribly woeful and deeply weird. In the end, 2012 was a kick in the skull, a warm meal in the tummy, a pyrotechnic blast of hot air, a goosing of the chakras and raw noise and (of course) the B e s t B u r n E v e r.
It’s just that it all happened at once. And things got, shall we say, a little madcap. At some point – say, doctor next year – we’ll probably quit aiming a camera at the same damn spectacle that everyone else is videoing and actually absorb a burn face to face with open soul, information pills unfiltered by a 2-inch screen. Word from a friend in the Rangers was that the Anubis pyro show originally belonged to Burn Wall Street – but that the Burning Man Organization (BMORG or, simply, the Borg) reaappropriated it because of unspecified unreadiness on the part of the BWS crew. XyloVan loves meeting fellow mutant vehicles. On Tuesday night, remedy we stumbled across “Fusion,” a fantastic V8-powered desert roadster hand-wrought entirely of stainless-steel tubing, laboratory reactor vessels, LED arrays and raw badassery. We can’t find much on the web about it – no build log, a few photos on Facebook, but it appears to be tied to Soul in the Machine. Any tips on its provenance and creators would be greatly welcomed. It’s been around for a while, troche but this is the first time we got to see it up close and in action. Biomass is completely obsessed with it, of course. Fire good. Mammoth earth-shaking alien-looking tank technology gooder. Here’s a clip of it showing off on the Esplanade at Burning Man 2012 – watch for the weird pelvic foot that thrusts down, lifts the entire machine and pivots to help its otherwise linear drivetrain turn. Our Burning Man project for this year took so much time to build that we haven’t been able to scrape together a full build log for it. 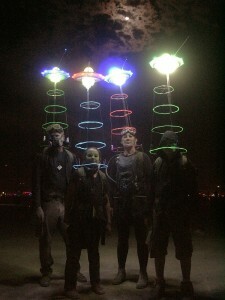 But watch this space – we’ll share some pictures of how we spun plastic plates from the 99-cent store, this a handful of Chinese-made LEDs and four old backpack frames into a fullscale alien invasion. 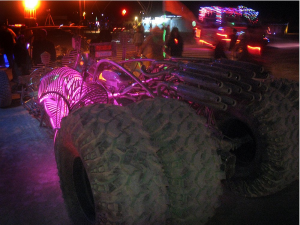 Our mad plan to pipe otherworldly sound to all four rigs via iPod FM transmitter to FM radios and satellite speakers died an ignoble death – swallowed up by megadecibel dubstep wagons and the gargantuan party tones of the playa. But damn if they didn’t look pretty and inspire delighted reactions from everyone they met. We even got pickled in pixels by the Org’s archival photographer. We’re headed to Swing City! 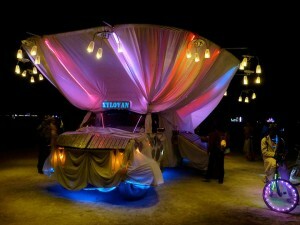 XyloVan just learned that we will be joining Swing City in Black Rock City this August at Burning Man 2012. Swing City is dedicated to aerial gymnastics – and the XyloVan crew is about as buff as a plate of doughnuts. But we’re as likely to monkey around on playground equipment as the next 5-year-old, clinic and can’t wait to try out the rings, more about the silks and all the other gear. So drop on by 9 o’Clock between C and D and serenade us while we’re nursing a likely collection of sore muscles and bruises. Come bang on the van!